Mr Li Feng, Chairman & CEO, CMI Ltd; Mr Song Yaoming, Minister, Economic and Commercial Office, Chinese Embassy, Japan; Mr Takagi Seiji, Director General, International Affairs, Global Strategy Bureau, Ministry of Internal Affairs and Communications, Japan; Mr Jian Qin, Executive V.P., China Mobile Communications Group Co., Ltd.; Mr Akira Hamada, Country Head, CMI, Japan Office. 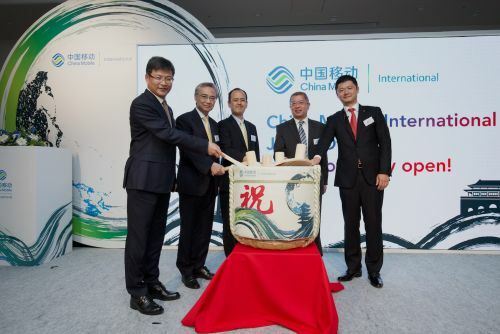 TOKYO, May 23, 2018 - (ACN Newswire) - China Mobile International Limited (CMI) hosted the opening ceremony of its Japan office in Tokyo. Attending were Mr. Song Yaoming, Minister of Economic and Commercial Office, Embassy of the People's Republic of China in Japan, Mr. Takagi Seiji, Director General for International Affairs, Global Strategy Bureau, Ministry of Internal Affairs and Communications, Mr. Jian Qin, Executive Vice President of China Mobile Communications Group Co., Ltd., and Mr. Li Feng, Chairman & Chief Executive Officer of China Mobile International Limited. China Mobile International Limited (CMI) is a wholly owned subsidiary of China Mobile. China Mobile is now the largest telecom operator in the world by network scale and subscriber base and is among the top in terms of market capitalization and brand value. To provide better services to meet the growing demand in the international telecommunications market, China Mobile established a subsidiary, CMI, in December 2010, mainly responsible for the operation of international business. Leveraging the strong support of China Mobile, CMI provides a full range of comprehensive international telecommunications services which includes IDD, roaming, Internet, MNC services and Value-Added Business across the globe. Headquartered in Hong Kong, CMI has expanded its footprint to 20 countries across different regions. www.cmi.chinamobile.com.